The upper South Island is known to Māori as Te Tau Ihu o te Waka-a-Māui – the prow of the demigod Māui's waka (canoe), the waka being the South Island. The waka Te Awatea Hou was carved by Te Tau Ihu tribes for commemorations of the 150th anniversary of the Treaty of Waitangi in 1990. 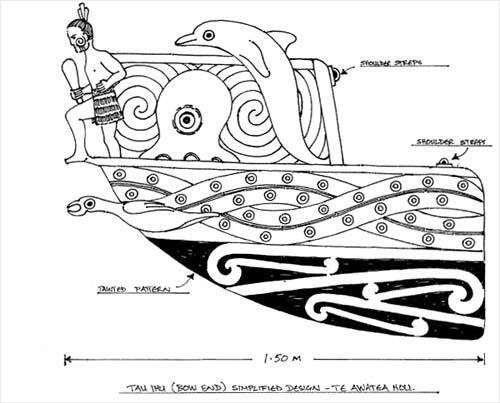 The waka no longer exists, but this drawing depicts its prow. The figurehead is Kupe, the legendary navigator. Behind him are the octopus which he fought in Cook Strait; the shag which gave its name to Te Aumiti a te Kawau-a-Toru (French Pass); and Tuhirangi, a taniwha or dolphin which escorted voyagers through the pass, as the dolphin Pelorus Jack was also to do around 1900.